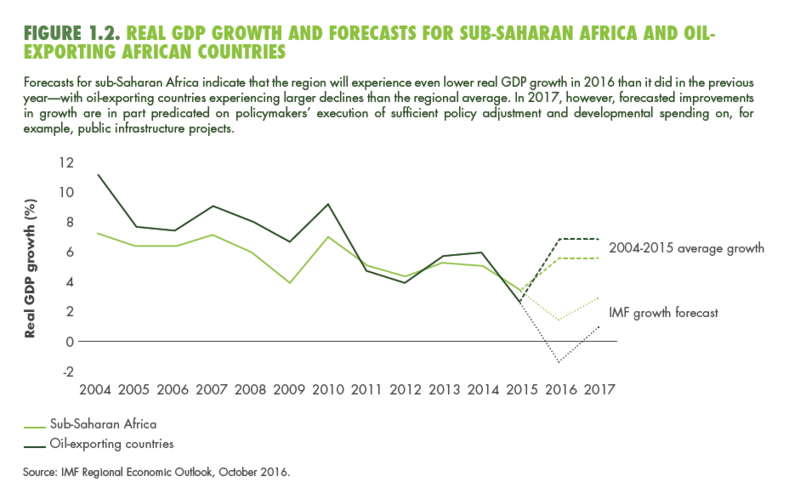 Below is Chapter 1 of the Foresight Africa 2017 report, which explores six overarching themes that provide opportunities for Africa to overcome its obstacles and spur inclusive growth. You can also join the conversation using #ForesightAfrica. While prospects remain encouraging for many sub-Saharan African countries, how things have changed for the oil-exporting ones!1 Prior to 2014, oil exporters boasted an average current account surplus and even managed to generate a small government budget surplus (Figure 1.1). But then in 2014 oil prices fell so abruptly that by early 2016 they had breached their 10-year low. As revenues from oil exports shrunk, government revenues that largely depend on them fell, and so government financing requirements increased. Sub-Saharan African oil exporters are now faced with the “twin deficits” of their current account and government budget. Unfortunately, and although oil prices have somewhat recovered, prospects do not look good and external financing will be difficult to obtain next year. The challenge is that external financing requirements are increasing exactly at the same time as financial conditions are tightening. The United States’ interest rates are increasing, which not only raises refinancing costs and the cost of new borrowing, but also dampens the search for yield and reduces the appetite for risk that had pushed investors to venture in frontier markets, including in Africa. Capital flows to oil-exporting countries may decline further or, even worse, reverse. Tighter financial conditions leave credible and decisive domestic adjustment as the main policy option to address growing financing needs. Unfortunately, oil exporters have so far been rather tentative in their adjustment efforts. In the face of depleted buffers and tighter financial conditions, they have been slow and at times even reluctant to implement much-needed macroeconomic adjustments. 2017, then, is the time to use the oil shocks to not only implement the right macroeconomic policy mix but also to put oil-dependent economies on a better footing so they can make significant progress towards the sustainable development goals (SDGs). There is really no other choice as oil prices are expected to remain low for long (even though they have been rising of late). Short-term adjustment will only be a “pain medicine” and sectoral policies, including in agriculture, will be needed to diversify oil-rich economies and strengthen their structural transformation. Financing will only be one part of the equation and raising more revenues from the non-oil economy is an option that should be exercised. But now that oil rents have shrunk, it is the time to accelerate the pace of reforms that do not require much funding such as improving the efficiency of spending. Policymakers will need the right combination of political will, effective communication, and private sector and other stakeholders’ involvement. The social contract in place during the boom years should be revisited. The boom and bust cycle of oil prices is leading to macroeconomic imbalances that will need to be financed. Fluctuations in the price of oil give a sense of how brutal the shock has been for oil exporters. The price of the commodity fell from $112 per barrel in mid-2014 to less than $39 in early January 2016. Falling oil prices have led to lower export revenues, deteriorated current account balances, and put pressure on currencies. Figure 1.1 shows how the current account deficit for oil exporters moved from positive to negative territory from 2013 to 2014. Such countries managed to generate a current account surplus of 3.8 percent of GDP in 2013, which fell to a deficit of 0.6 percent in 2014 and worsened to 4.7 percent of GDP in 2015. Figure 1.1 also shows how fiscal balances have worsened over time. The large oil shock led to increased financing, and now a crucial question is to what extent external financing will be available in 2017. Unfortunately, and although oil prices have somewhat recovered, prospects do not look good and external financing will be difficult to obtain next year. One buffer against falling oil prices is the level of international reserves, but such a buffer is limited. Oil-exporting countries in the region have been depleting their international reserves and, as noted by World Bank (2016), the cumulative decline in international reserves in oil-exporting countries in the region was more than 30 percent between end-June 2014 and March 2016. IMF (2016) also remarks that these countries have financed about two-thirds of their current account deficit by drawing on international reserves to the tune of 1.5 percent of GDP each year since 2014. In the first half of 2016 alone, a number of oil-exporting countries, such as Angola, Gabon, and the Republic of the Congo, saw credit rating downgrades. Foreign borrowing can also help finance the widening current account of oil exporters. But, as noted above, accessing the international debt market is becoming increasingly difficult and costly. In 2016, only South Africa and Ghana tapped international bond markets, the latter raising $750 million at yield of 9.25 percent after having delayed the issuance because of the higher price demanded by investors.2 It is useful to note that unlike oil-exporting countries like Nigeria and Angola, Ghana was already under an IMF program and had already started its domestic macroeconomic adjustment. As noted by World Bank (2016), the pace of credit rating downgrades has accelerated over the past year. In the first half of 2016 alone, a number of oil-exporting countries, such as Angola, Gabon, and the Republic of the Congo, saw credit rating downgrades. Higher interest rates and lower ratings are complicating these countries’ efforts to access international markets. 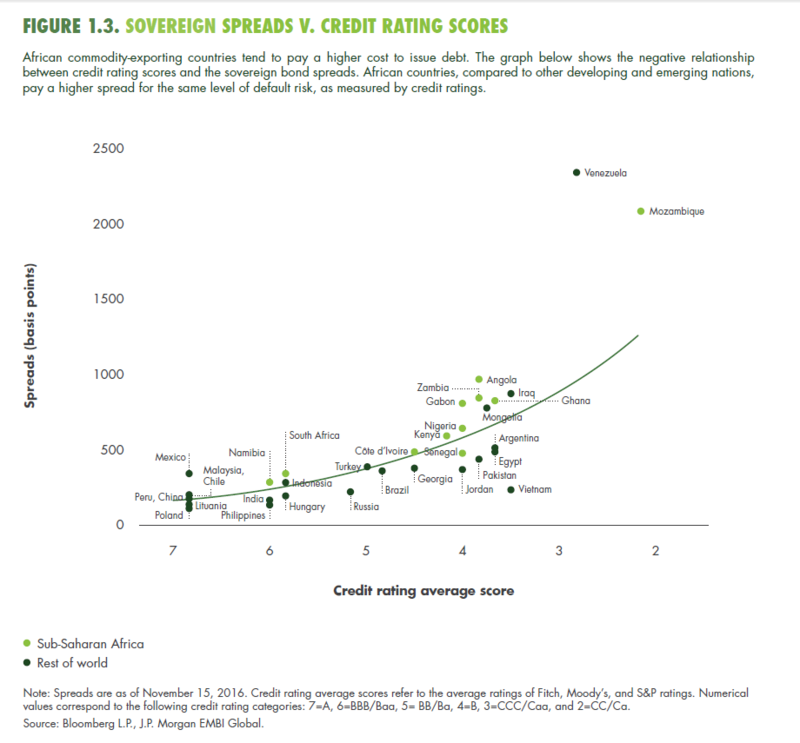 Figure 1.3, which shows sovereign bond spreads and ratings as of November 15, 2016 (before Mozambique’s downgrade to “restrictive default” from CC by Fitch Ratings) indicates that oil- (and commodity-) exporting countries pay a relatively higher cost to issue debt. Nigeria’s planned international bond issuance, its first since 2013, will provide a litmus test for other African oil-exporting countries seeking to finance themselves externally. 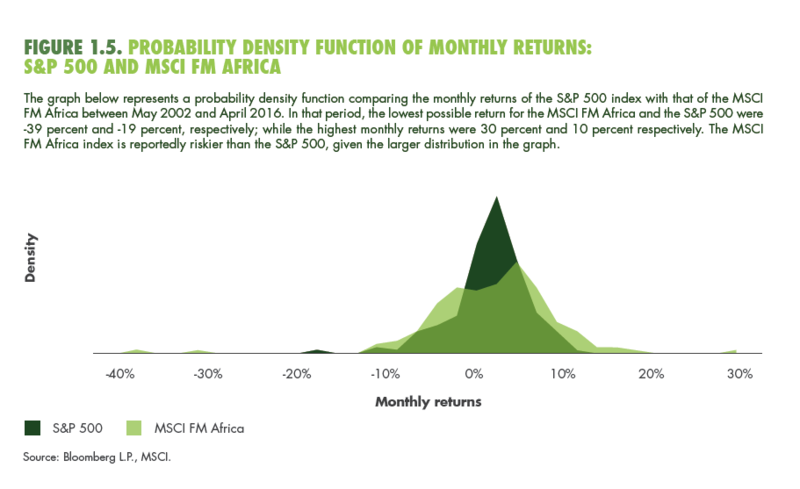 Capital inflows (foreign direct investment (FDI) and portfolio inflows) are typically sought to finance current account deficits (with a preference for the former as it is more stable), but there are indications that investors are not as eager to invest in many oil-exporting countries as in other African countries. Indeed, World Bank (2016) notes that capital inflows in the region have slowed. In the case of Nigeria, capital inflows fell by 55 percent in the first quarter of 2016 while outflows more than doubled. Against this background of tight foreign financing, what policy options are left for African oil exporters? The typical medicine against a negative oil shock for oil exporters is a combination of fiscal contraction, currency depreciation, and monetary tightening (to limit inflationary pressures). In addition, state-owned enterprises (SOEs) and the financial sector are closely watched to avoid any bad surprises such as the materialization of quasi-fiscal liabilities and higher nonperforming loans from exposures to oil and gas and currency mismatches. To make the medicine easier to ingest, existing policy buffers can be used to smooth the adjustment. When policy buffers are too low, multilateral institutions such as the IMF, the African Development Bank, and the World Bank as well as bilateral donors, including China, are asked to pitch in (when the political economy environment allows it). But unlike more diversified economies, oil-dependent economies are like oil tankers, and they are difficult to turn around quickly. But unlike more diversified economies, oil-dependent economies are like oil tankers, and they are difficult to turn around quickly. Still, implementing the right set of policies quickly and in a credible way is crucial. Unfortunately, African oil exporters have typically not been able to manage this difficult situation as credibly and decisively as they need to. Slow exchange rate adjustment is evident not only in the dwindling international reserves of African oil-exporting countries but also in the scarcity of foreign exchange (getting U.S. dollars has becoming increasingly difficult in Nigeria, for instance), and in the large gap between parallel markets and official exchange rates such as in Angola and Nigeria. Budget outturns show that many countries were not able to rein in current expenditures or to execute capital expenditures (as in Nigeria, which sought to use it as countercyclical policy). In many countries, government debt has risen and a larger share of falling revenues are now allocated to service debt. IMF (2016) notes, for instance, that public debt has increased sharply among oil exporters by 20 percentage points of GDP since 2013 (although from a low level in Nigeria). Government arrears have also increased, and some governments have even resorted to central bank financing. Reasons for not achieving the right and timely policy mix have been numerous and include treating the oil shock as a temporary shock rather than a permanent one, long delays in coordination between ministries and in execution, and difficulty in managing the political economy of reform. 2017 is the time to accelerate the implementation of the domestic revenue mobilization agenda. A silver lining, however, is that the current shock and its negative consequences on the economies and lives of the citizens of African oil-exporting countries can be an opportunity to “fix the machine.” Indeed, the sharp fall in oil prices has highlighted the fragility of the current growth model. Structural transformation is not deeply rooted, and there has been little progress in diversifying economies and the overdependence on oil-export revenues. 2017 is the time to accelerate the implementation of the domestic revenue mobilization agenda, which was much heralded in the 2015 Addis Ababa Action Agenda, and improve the taxation of the non-oil economy, consider the merit of increasing the VAT (value-added tax) rate, and revisit poorly targeted tax exemptions and subsidies. 2017 is also the time to ensure that capital expenditures (which are still needed to finance the large infrastructure gap) have a value for money and outcomes that are really growth enhancing. 2017 is the time to revisit how current expenditures in the oil economy were part of an ineffective social contract where oil windfalls would result in a higher wage bill and increased government spending for goods and services. 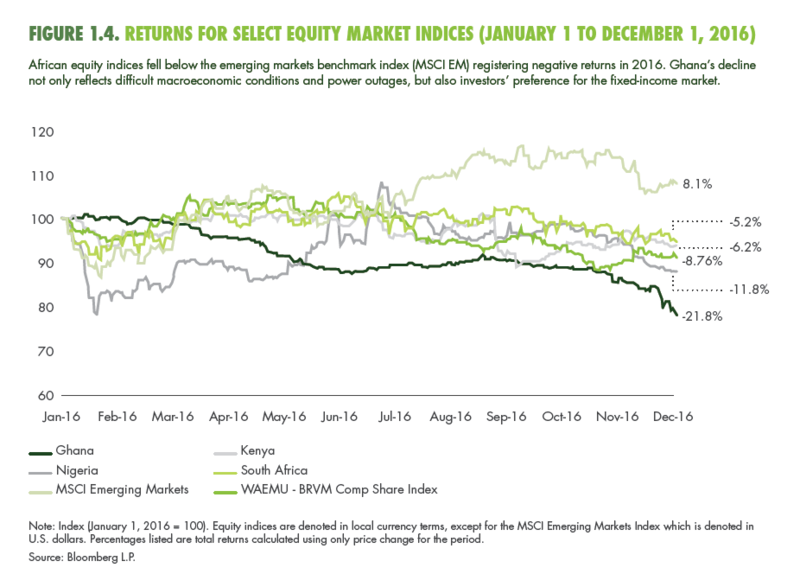 2017 is the time to reconsider the role of the private sector and the financial sector as engines of broad-based growth beyond their typical dependence on government contracts and oil and gas revenues. In the oil economy, the government is too often the be-all-end-all and crowds out or even stunts the private sector. 2017 is the time to level the playing field and revisit the role of the state and its areas of interventions, including reducing the cost of doing business and providing adequate infrastructure to boost private sector-led growth and competitiveness. Such measures are also part of the needed new social contract. 2017 is also the time to take a serious look at the social compact in oil-exporting countries. Social protection expenditures can be very low in oil-exporting countries and should be revisited. After all, how much did the poor really benefit from the boom cycle in oil prices? Now that adjustment times have come, how much of its cost should they bear? 2017 is the time to build the capacity to implement targeted interventions and proceed to implement targeted social protection measures to help smooth the effects of the necessary macroeconomic adjustment. For instance, increasing the VAT, which is a regressive tax should be accompanied by well-targeted compensation of the poorest segments of the population. Policymakers in oil-exporting countries need a three-pronged approach that will credibly and decisively focus on macroeconomic adjustment, set the basis for medium-term broad-based growth, and revisit the social contract. These objectives are vital at this juncture, and addressing short-term issues must be done to avoid jeopardizing medium-term growth. We use the IMF definition of oil-exporting countries: “countries where net oil exports make up 30 percent or more of total exports. Except for Angola, Nigeria, and South Sudan, they belong to the Central African Economic and Monetary Community (CEMAC).” See IMF (2016). Bloomberg, September 8, 2016. Available at: https://www.bloomberg.com/news/articles/2016-09-08/ghana-selling-benchmark-size eurobond-in-fourth-issue-since-2013. See Sy and Sow (2016).